On a Friday before a Grand Prix the news should be all about free practice. But not today; never mind that Ferrari have been quick in the first session, thereby showing that the tests at Monza gave a false impression - the big story remains the latest concerted attack on McLaren. I am so sickened by the events of the last 48 hours or so that I really don't want to go over the details again. F1 Fanatic has a good article on the build-up to the reconvened WMSC hearing, Ollie's Blog F1 gives details of the fine levied on McLaren over a new gearbox casing. And Craig's blog looks back over the history of McLaren's problems this year, wondering what the implications are for the world championships. Those posts and their comments give the essential facts that are known and the various opinions on the story so far. I have added the occasional comment too and have nothing left to say except to register my disgust at the way the FIA has handled matters. It really is time that they considered how much their own actions bring the sport into disrepute. So it was refreshing to arrive at Sidepodcast dot com and find a video of the GPLive event in May of this year. To see the old cars being driven in earnest once again took me back to happier days when we were not constantly interrupted with scandals and odd decisions from the FIA. Politics existed then, too, but it did not threaten the existence of the sport in the way that the latest saga does. All of us look back to a time when it seemed F1 was perfect; usually that was when we first discovered the sport and became fascinated by it. As the years passed, we became aware of things that were not right, sometimes things that spoiled the racing itself, at others peripheral matters that should not have been allowed to affect the outcome of races but did. I have seen the crises come and go but always it was possible to turn back to the GPs and enjoy them for their own sake. Not so these days, it seems. A matter of industrial espionage is blown out of all proportion and, instead of waiting to see the outcome of the court cases pending on the matter, the FIA has to jump in and interfere prematurely. Whether it is true or not, the governing body has to recognize that its actions are seen all too often as being influenced by matters that should be no concern of theirs. Last year it was Renault that was the object of scrutiny and subsequent dubious decisions; this year McLaren are under the axe. For how long can we believe that this is coincidence and there is no pro-Ferrari bias in the FIA? But I said I would not say any more. Enough, enough, I will go back to Sidepodcast and run that video again and again (there are some great shots of the Brabham BT49 in it, of course) until I forget all the nonsense happening today. Perhaps tomorrow I'll get annoyed enough again to re-enter the fray. I for one, would beg to differ from you about the actions of the FIA, in this nonsense (as yourself and Bernie like to call it [:)] ). If anything, i don't blame the FIA for getting involved now; i blame the FIA for NOT getting involved in the Toyota f1 espionage scandal as well. F1 as we should realize is a multifaceted monster. The legal process is looking into possible irregularities in "F1 - The Business"
FIA, here i believe is looking into "F1 - The Sport". Questioning of FIA's "interference" into this affair questions the very need for existence of the governing body IMHO. The governing body has a responsibility to ensure that the sport functions free and fair and every team has a fair chance of winning a championship. The prolonged legal process at the end of it all shall only tell us if an entire team was involved in acquiring other teams information or not. I shall have the audacity to predict that the ruling is going to be in favor of Mclaren, that they were not involved entirely as a team in acquiring illegal knowledge (unlike Toyota in 2002) about a competitor. What it will never tell us is to what extent the knowledge of other team's car, regardless to whether the entire team or a bunch of individuals were involved, could have impacted the current championship fight. Lets take a look at the Toyota scandal. After 4 years, we now know that information was smuggled from Ferrari by two new recruits. But, we never were authoritatively told if toyota benefited from the information or not, although its hard to believe they did not, given that there were even email's circulated withing Cologne asking people to destroy any Ferrari related documents. You're quite right on all points, Uppili. But my argument with the FIA's actions is about timing, not whether they should have become involved or not. I think they began the process too soon, before they had any evidence. The verdict of the first hearing shows this. Had they waited until there was evidence of wrongdoing (as would a court of law), the matter would not have hovered over F1 like a dark cloud for so long. I've mostly stayed out of this whole subject to be honest. Are Ferrari and the FIA carrying out a witchhunt against Mclaren? Is Ron Dennis not nearly as straight as he would like us to think? I don't know. In fact, I'm half left wondering whether such espionage isn't absolutely routine in the sport. 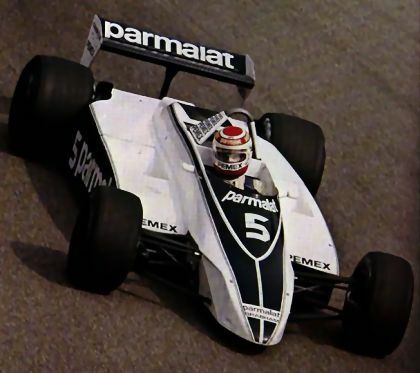 Of course, there's an irony in your choice of a picture of Piquet in a Brabham. Its generally reckoned he won the 1983 title in an illegal car! I am left wondering too, Patrick. In fact, that is my complaint, more than anything else - that I shouldn't have to wonder whether F1 is rotten at its core. I want to believe Ron Dennis, to know that this whole sleazy business is merely the work of two malcontents out for personal gain, rather than the uncovering of widespread dishonesty that runs through the fabric of the sport. Will the courts ever reveal the truth of the matter? I don't know and at times I don't care. What I really want, I suppose, is to be allowed to return to my cosy illusions. Hence a pox on both their houses.